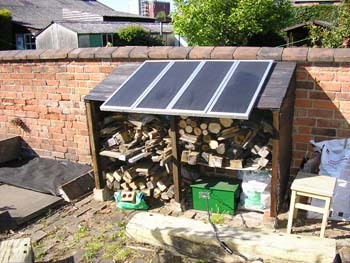 During 2007 this simple solar photovoltaic (PV) system has provided some of my energy needs (OK, a pretty small percentage I’ll admit). In total there are approximately 40W(peak) of PV panels. 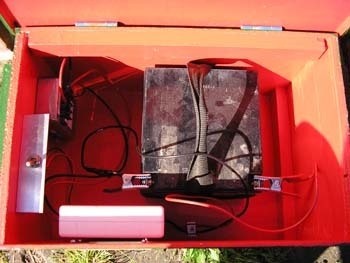 This charges a sealed ‘gel’ type lead-acid battery with a charge controller to ensure no overcharging. The battery can then be moved and used to power various devices including 12V lights, laptops (through a suitable converter) and audio equipment (through a pure sine wave DC to AC inverter). 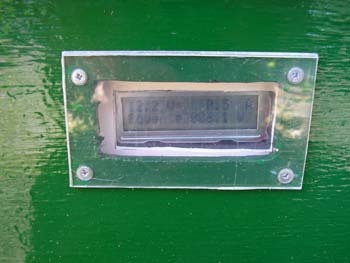 There is a display to show the power being fed into the battery along with the battery voltage.Two batteries are used in rotation, with one being recharged while the other is used.